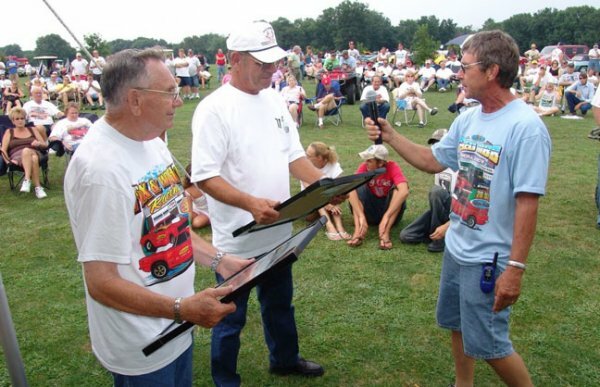 Ken Brown, (left) a coordinator of the Fred Gibb Memorial car show, presents Herb Fox (left) of La Harpe and Carl Ward, from Savannah, Georgia framed pictures of this year's 9th annual shirt logo that features two race cars Fox had raced during the Fred Gibb era. One race car was "Fox & Ward" driven by Herb Fox and owned and "wrenched" by Carl Ward. The other car was "Fox & Wright" owned together by Herb Fox and mechanic, the late Glen Wright of La Harpe. Both cars were sponsored by Fred Gibb of which his Chevrolet emblem was on the doors of the bright orange-red race cars. The men were honored at the 9th annual Memorial car show this weekend where a large crowd was dazzled from the sky with a 10:00 opening of parachute jumpers and biplane acrobatics followed by the National Guard presenting the colors. They were delighted from the ground with everything from motorcycles, and the classics, to the latest supercars, plus the new edition of 5 semi cabs you could check out. Brown reported a total of 375-400 cars this year, despite the high gas prices. Ward also received the plaque for traveling the longest miles. He hasn't missed a show yet!